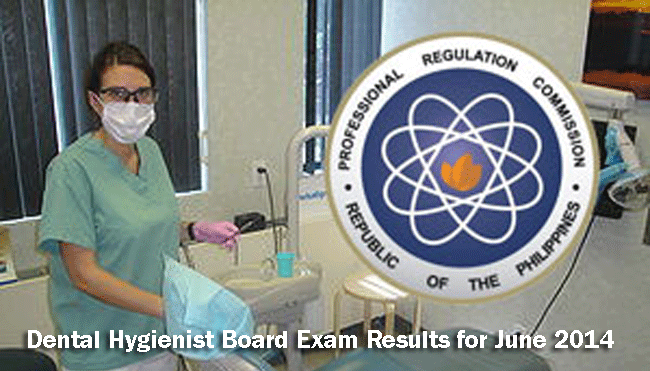 The Dental Hygienist Board Examination results for June 2014 is here and you have to look at the list in order to be sure if you passed or not.Dr. Rannier F. Reyes, Chairman; Dr. Gloria M. Bumanlag, Dr. Steve Mark G. Gan, Dr. Melinda L. Garcia and Dr. Dominador H. Santos, Jr., Members are the ones responsible for giving the licensure examination for Dental Hygienists. They are all members of the Board of Dentistry. 3 days after the last day of examination, the results were given. The examination took place on June 7 and 8, 2014 and it was on June 11, 2014 that the result was released. Once you have already passed the board exam, the next thing that you will do is to prepare all the necessary requirements in order to have your Personal Identification Card or IDs and Certificate of Registration. Initial Registration Fee of P450 and Annual Registration Fee of P420 for 2014-2017. Roster of Registered Professionals is the place to go for successful examinees.